Utilizing the sends in your DAW can really help you to achieve a great mix and take some of the pressure off of your CPU in the process. My favorite use of sends is for applying a single effect to a group of tracks. Drums or background vocals are great candidates for this. These track groups will generally have a similar sound and space within the mix so sending them all to one single instance of say a reverb or delay on a bus can help to glue together the overall sound of the track group, and save your CPU a lot of work. The example below uses the drum tracks from a recent project. There were seven mics used on the kit including a matching stereo pair of overheads, hi hat, snare drum (top), bass drum and a room mic. Since I’m trying to give the drums their own space, I found just the right reverb setting and used the sends on each track to connect to the reverb bus. This also gives me a lot of control over the entire drum kit and easy access to make global adjustments. 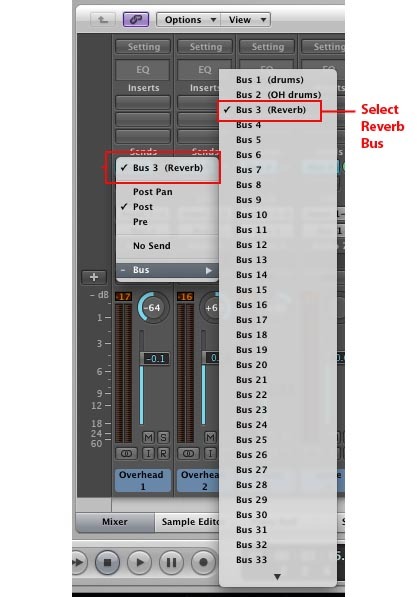 In this example we will add a reverb bus to a group of drum tracks and send the drums tracks to this bus. I’m using Logic Pro here but it works similarly in all DAWs. First you’ll need use an existing bus or create a new one. 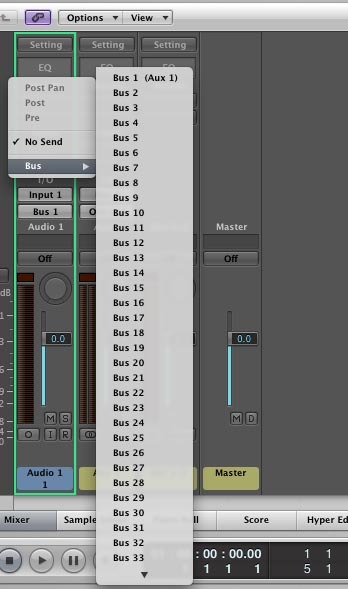 In Logic, you need to activate the bus from the track send. Next we will patch in the Reverb on this bus. 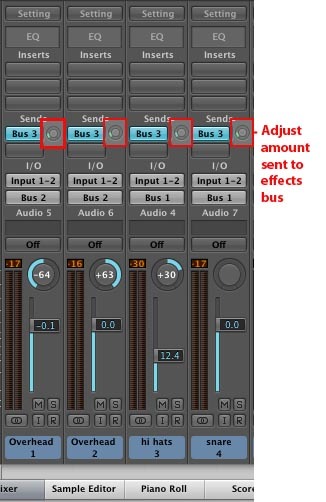 In most cases you will want to set up bus effects 100% wet and 0% dry. This way, you’re only picking up the effect and not duplicating the actual track signal through the bus. Now send the rest of your drum tracks to the Reverb bus. You can adjust the level of each track using the knob just to the right of the send (see below). This will send more or less of your track to the Reverb bus. 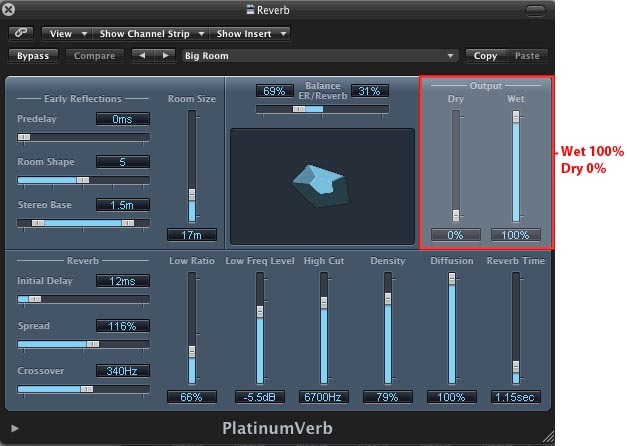 Also, you can make global adjustments to the overall reverb settings or amount on the Reverb bus. That’s all there is to it. 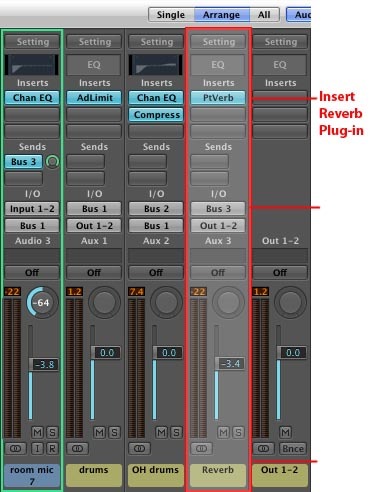 This works great for applying effects like reverbs, delays, chorus etc… You can also use this method for running parallel compression to enhance the overall sound (topic for another post). This entry was posted in audio, Logic, Mixing. Bookmark the permalink.